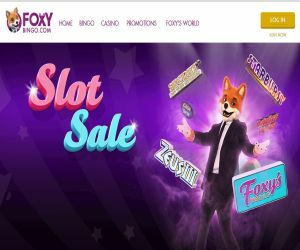 Foxy Bingo's Slot Sale | Win up to £25! It may be January, but this is no time to get a case of the January blues, as the sales season has begun! Just think of all those fab bargains, glam outfits and stylish gems you can hunt down to help you dress to impress and party into the New Year! With Foxy Bingo you don't even have to put on your shoes or leave the house to get in on sale action, as you can spice up your spirits with Foxy's January Slot Sale! With Foxy's Slot promotion , you can play your fave slots and collect some bonus-back bargains! The promotion runs this week until Sunday 10th January, so make sure you're in it to win it! You just need to simply wager as little as £10 on Foxy's featured slot games, and you can earn yourself bonuses-back on any losses! Each day you can spin a different slot, which range from Starburst and Zeus III to Foxy's World, Cash Spin and Irish Riches! You could even win a bonus worth up to £25, so you better get in on the Foxy sale action! If you sign up as a new player, you can bag yourself an extra £5 free registration bonus, on top of Foxy's fab 500% Welcome Offer! You can watch the latest Foxy TV advert below!